Iran, the land of rich civilization, is a magnificent treasure of art and culture. It is the origin of festivities and joyous ceremonies in honor of all the values of life. These festivals have been the identity of the great people of this amazing country. These festivals are compatible with the natural calendar and are inextricably linked with seasonal and climate change. In general, the ancient Iranian festivals are categorized in three groups: seasonal, annual, and monthly. The first group is seasonal festivals or Gahambars (literally means “proper seasons”) designed to commemorate the creation during six times a year since based on traditional beliefs, Ahura Mazda, the God of Zoroastrianism, has created the universe in six main periods. Each period had a name which used to be celebrated over five days across the Persia and today they are held with the same grandeur among the Zoroastrians. In the following, you will get to know with names and dates of all six seasonal festivals: 1.Maidyozarem Gahambar: Creation of the Heavens (‘Mid-Spring’ Feast) , Apr 30 – May 4 2.Maidyoshahem Gahambar: Creation of the Earth (‘Mid-Summer’ Feast), Jun 29 – Jul 3 3.Paitishahem Gahambar: Creation of the Water (‘Harvest’ Feast), Sep 12 – Sep 16 4.Ayathrem Gahambar: Creation of Trees and Plants (‘Herds’ Feast), Oct 12 – Oct 16 5.Maidyarem Gahambar: Creation of Animals (‘Mid-Year’/Winter Feast), Dec 31 – Jan 4 6.Hamaspathmaidyem Gahambar: Creation of Adam (‘Souls’ Feast), Mar 16 – Mar 20 The second group is annual festivals. Most of the festivals which are still celebrated today are in this group. According to Avestan texts, an Iranian year was divided into two equal parts: the beginning of summer was celebrated with Nowruz and that of winter with Mehregan. 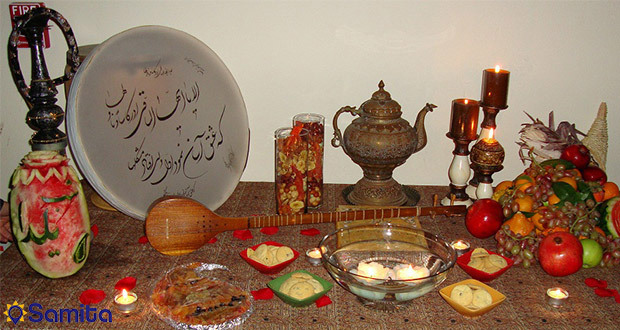 In the following, you will get acquainted with major ancient festivals which were held annually and are still respected: Yalda Night (meaning birth) as one of the oldest Iranian festivals is winter solstice and the longest night of the year that Iranians believe at this night light prevailed over darkness and Mithra (the god of light) is born symbolizing the victory of goodness in a long-fought battle with evil. To celebrate the victory, Iranian families get together and usually eat watermelon, pomegranate, and dried nuts. Due to the fact that fire was a sacred symbol for ancient Persians, they had a couple of festivals in honor of it and knew it as the son of Ahura Mazda for its purity and cleansing power in a way that the Aryans used fire to prove their innocence. As a striking example, the story Siavash passing through fire has been mentioned in the books of mythology. An important ancient festival in honor of fire was the Sadeh Festival held 50 days before Nowruz and in the middle of winter. About the history of the festival, there is a famous saying that Hushang, the Pishdadi king, discovered the mystery behind fire as a light emitted by God on creatures to ward off darkness and then ordered to praise it. The ancient Iranians used to set up a bonfire, enjoy eating and drinking, pray for forgiveness of sins and being away from adversities. Today, the festival is prevalent among the Zoroastrian people in cities such as Isfahan, Tehran and Kerman. Ancient Iranians believed that the five ending days of the year are not part of the universal calendar and they belong to the dead (Forouhars) that for which they used to hold a ceremony by lightening a fire on the roof of their houses in these days to guide their dead relatives. 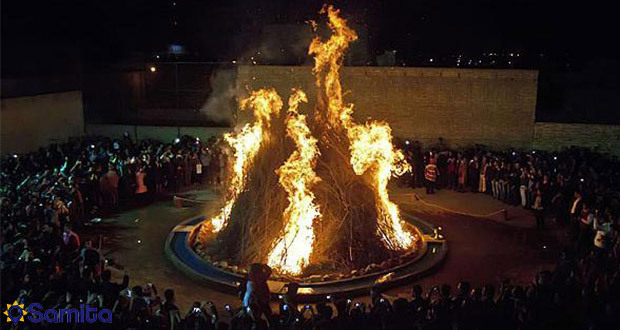 These two ceremonies were common among the Persians before the advent of Islam but after the attack by Arabs and making weeks in the Iranian calendar, the fire was reduced in holiness and praying gave its way to jumping over the fire in an amazing ceremony called Charshanbeh Souri or the festival of fire which is held on the last Tuesday night of the year together with other symbolic rituals such as Qashoq Zani (Banging the spoon on the bowl, making a treat or trick much similar to Halloween) and Falgoush (listening to the conversations of passersby secretly to reckon the fortune) to welcome Nowruz or New Year Festival. Nowruz celebrates the seasonal equinox and the beginning of spring; the oldest and most acclaimed festival of the world; a celebration in praise of nature with the message of peace and friendship to humanity. 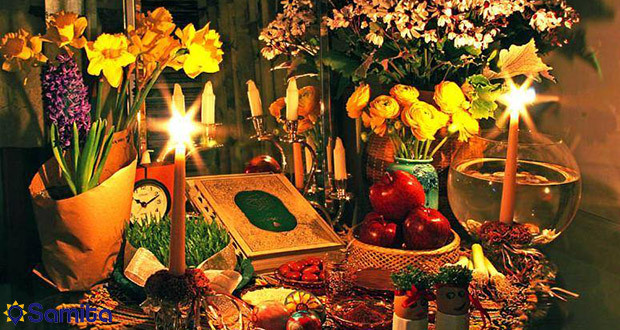 The first five days called small Nowruz belonged to public festivities and from the sixth day on coinciding with the birth of Zoroaster, the big Nowruz used to start when Zoroastrians get together in temples to celebrate their Prophet’s birthday. The third group is 12 monthly Zoroastrian festivals for all 12 months of the year to promote the three famous attributes of good words, good deeds, and good thoughts. In ancient Iran, each day of the month had a name and all months had 30 days and whenever the name of a day coincided with that of the month, a feast was held. 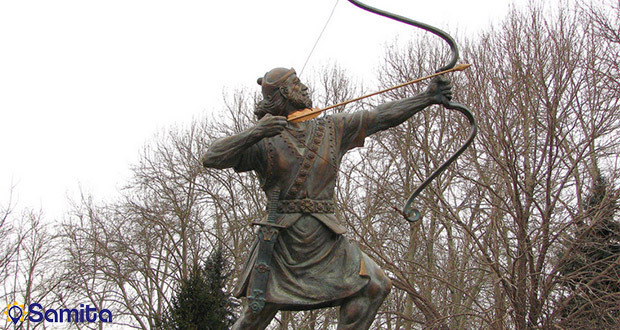 Among them, three festivals are of more importance and most widely celebrated as follows: Observed on 13th day of the month of Tir, the festival of Tirgan was to appreciate rain and refers to an arrow that Arash, a heroic archer of Iranian folklore, threw to determine Iran-Turan border on the order of Iranian King Manouchehr. On this day, people enjoy throwing water at each other. Celebrated on the 16th day of the month of Mehr, Mehregan was the national thanksgiving festival at the time of autumn harvest which symbolically starts the beginning of the second half of the year. This feast was held for six days, starting on “Mehr Rouz” and ending on “Raam Rouz”. In these days, farmers complete their harvest and thank God for it. 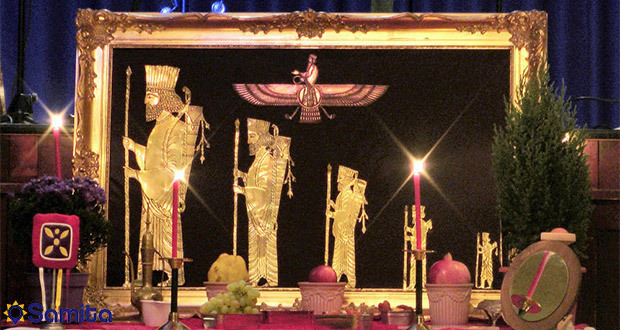 The ceremony is observed today by Zoroastrians.